Join us for an amazing weekend of food, fun and family in Ocean City, MD. 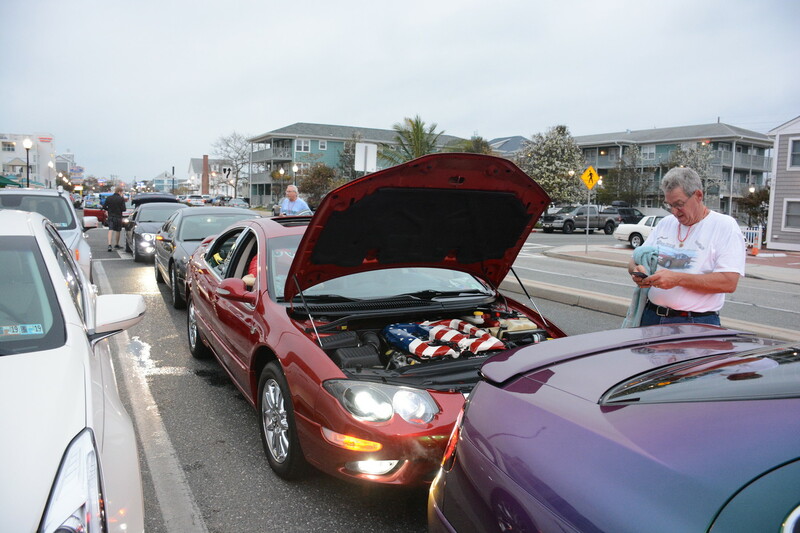 For a hand full of members, the Endless Summer Cruisin' meet in Ocean City, Maryland started on Wednesday. John and Barb arrived in western Maryland for the night, Robert and Nick to PA for the night, Keith and Lindsey arrived to Bob's house for the night where Bob and Darlene also returned to change suitcases and head to OC in the morning. The NJ crew grew by Clarence and Stephanie to finish the miles to Ocean City and gather the group! Following a late lunch at the Brew Pub, the group relocated to Seacrets for a night show. A beautiful sunset and lots of catching up for the group led us to Dumsers for ice cream for dinner and a word search race. As we returned to the hotel, we claimed a nearby street corner as our hang out for the weekend. Friday morning woke us early to participate in the parade down the boardwalk. Clarence led the group throwing candy to the many viewers, Keith followed with some shock and awe for the crowd as the colored changed as he drove by, Bob had some company with Sean and a Red M&M out the sunroof tossing M&Ms to the crowd, John tried not to hit any candy runners, Robert followed representing team PBW, and Cindy rounded out the line of Ms in front of an annoying ouga horn. And for the first time ever, Lindsey did not have an out of shape run down the boardwalk but caught a ride to hear the amazing comments about our cars. It's a really cool thing to be a part of! 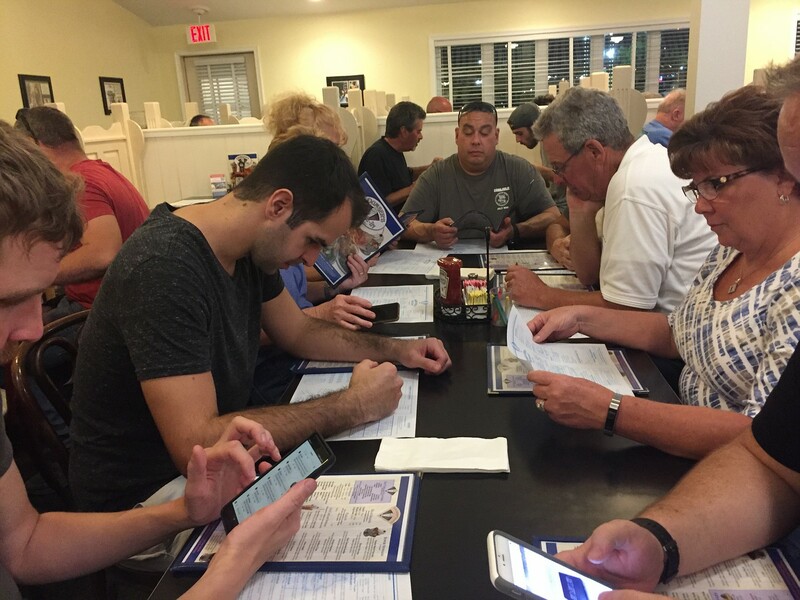 Upon parking our half dozen Ms, the group headed to our traditional breakfast spot and beat the crowds. As we returned to the inlet, the cleaning and setup began. Many checked on and ordered their parade pictures, walked the aisle of cars, and chatted as a group. Dave spoiled Cindy with beautiful jewelry and more custom Goofy airbrushed t-shirts - Stephanie and Lindsey took notes of these tactics! In between leaving the inlet and gathering for dinner, Keith met up with Trevor (former club member custom300m) and some friends for a photo shoot of the newly dipped M-Pressive. Dinner began the rum bucket intake and included a celebration for Lizzie's birthday! Returning to the hotel with a trip to the pool bar for more rum buckets, the group gathered on our street corner to watch the crusin' and laugh till it hurt. Wendy, Nick's mom, made friends with a stranger who provided many laughs and it's a good thing he wasn't paying full attention to her! Boy did we drink and boy did we laugh! With some quick documenting pictures of the rum bucket consumption, the group headed for hotel rooms for a short night's sleep. 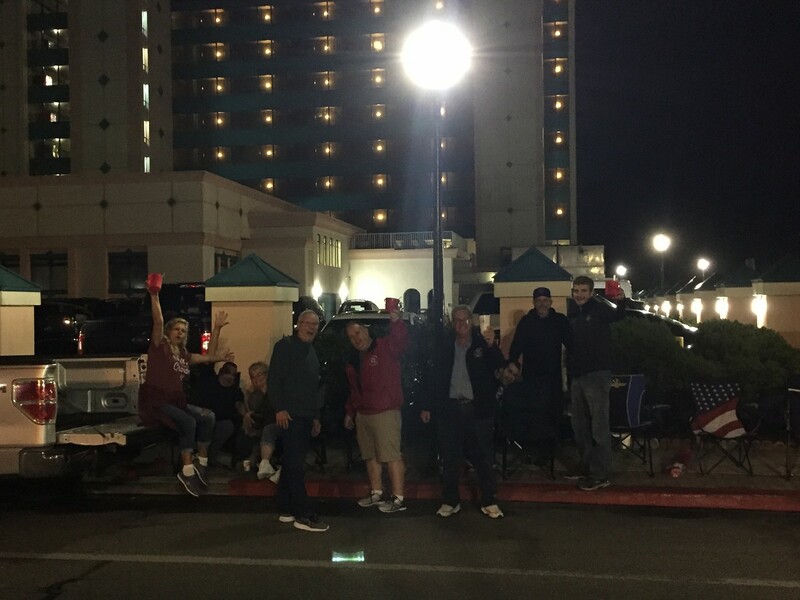 Saturday started after only a few hours of sleep for some as they got to the inlet at 5am to claim our best parking spots of the weekend. A passing rain shower allowed for in-car naps and then as the group grew, back to our traditional breakfast cafe to eat. Quickly returning to clean for the big day of spectators, the group checked out the boardwalk, ate yummy food like pretzel wraps, Thrashers fries, and Kohr's custard, and sat around enjoying each other's company. 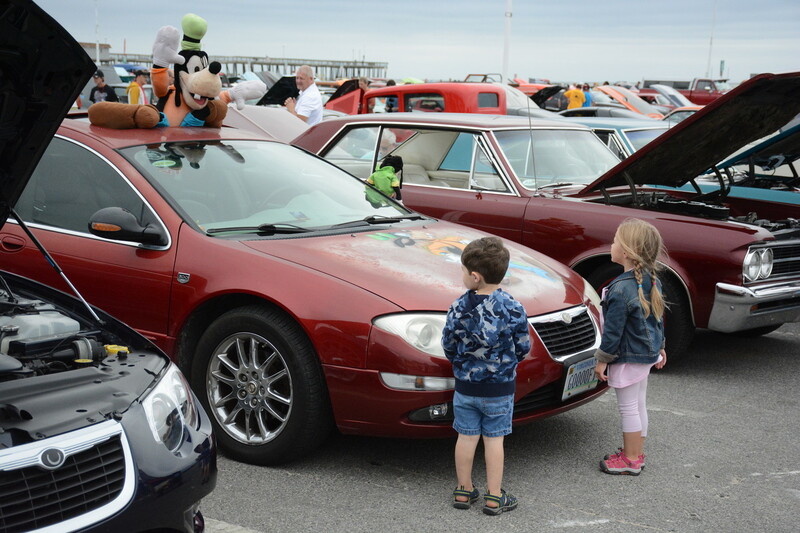 While the weather was overcast and breeze, we had a great day at the inlet with lots of spectators checking out the cars. Goofy's headlights got a little rehab and came out beautifully while Kelly, Lizzie, and Darlene went shopping. Saturday night took the group back out to dinner while Keith and Lindsey frantically tried to make as much of the ICE (in car entertainment) in M-Pressive work as possible. Gathering on the boardwalk near the rides for the light show, Robert and Keith opened them up to show off their lights! They looked great!! With many spectators checking them out, you could tell the thought that went into each setups. As a fundraiser for a local Boy Scouts troop, spectators voted by placing donations in a bucket placed in front of each car. It was a pretty successful night with Keith winning 1st place! Starving, after making as much of the ICE work as possible, Lindsey, Keith were joined by Clarence and Stephanie for pizza (with the second-ing from Tim that Tony's was good!) while the rest of the group returning to Dumsers for ice cream. Having slept little the night before, the group couldn't help but gather on 'our' street corner for a drink and more laughs. While Clarence and Stephanie had the last round of rum buckets, the group called it somewhat early knowing how many miles awaited us on Sunday. Sunday morning is much more relaxed as we trickled into the inlet. Meeting at Dough Roller for breakfast, the group first said goodbye to John and Barb as they started their long trip home to Indy. After a yummy meal, an exciting club award announcement awarding Clarence Best in Show of our meet, the group returned to the inlet to sit. Well, all except Clarence, who cleaned once again - newbie! Many re-registered to return to OC next October and after a circle clearing trip to the dog store to buy treats for our four legged family members, the group returned to gather for raffle prizes and the show award ceremony. 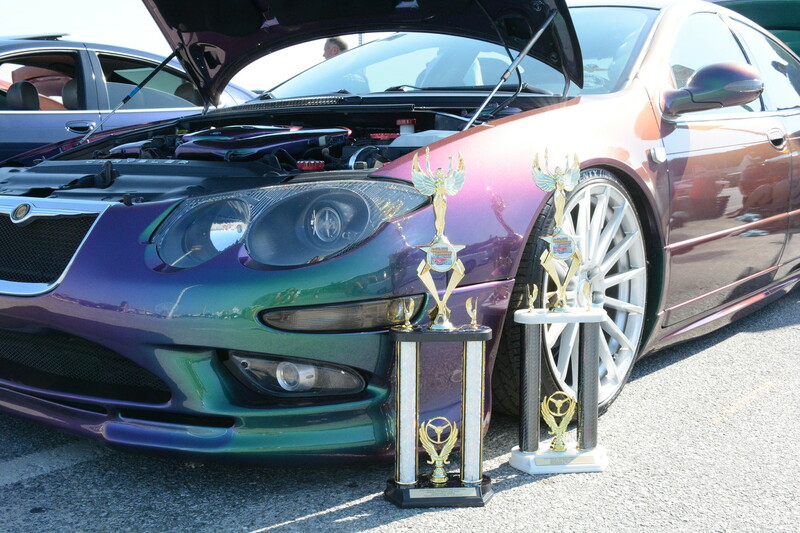 While hot, the group was successful - Bob won a lottery ticket for stumping the host on a tire company, Keith won a top 20 trophy for the Sunday morning inlet show, and the club won Best Club! 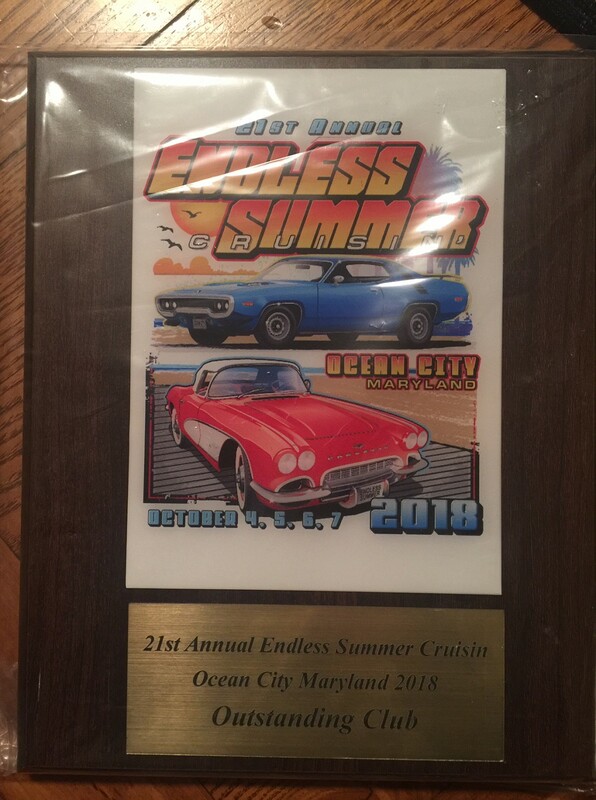 Re: Ocean City 2018 Recap! Great recap as usual, hard to wrap up such good times in words. Looking like the event is starting to recognize later year cars as acceptable. 7 of the Top 20 were 2000 and up. Members should consider joining our ranks for this final meet of the year. Wow, what an honor for the Club to win Best Club! I'll come again someday maybe - but not next year - I'll be in/at 2 different weddings for Columbus Day weekend. Glad to hear and see that awards were won, delicious food was had, and a good time was had by all! Great recap Lindsey. 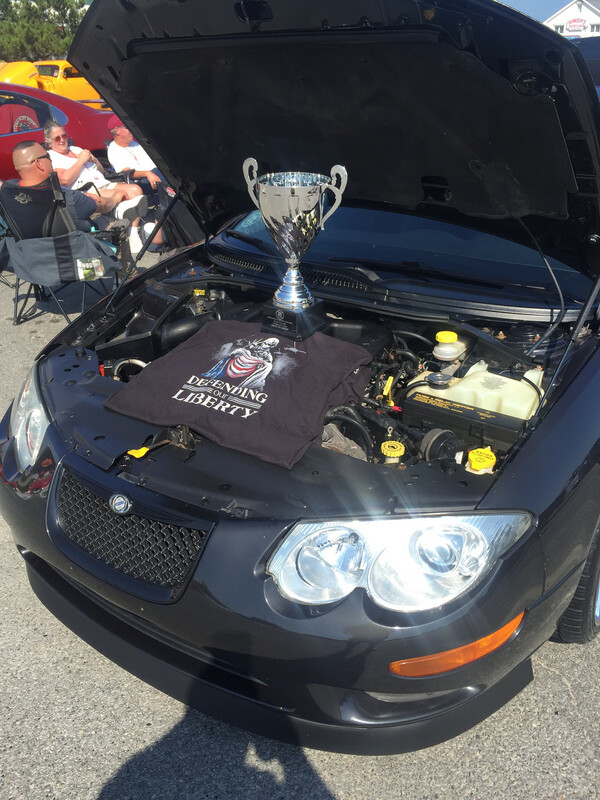 As with all of our club meets, you need to be there to really appreciate the camaraderie and soak up the atmosphere of the meet. I found that out when I attended my first meet in Kansas City waaay back when and got hooked on going to meets. 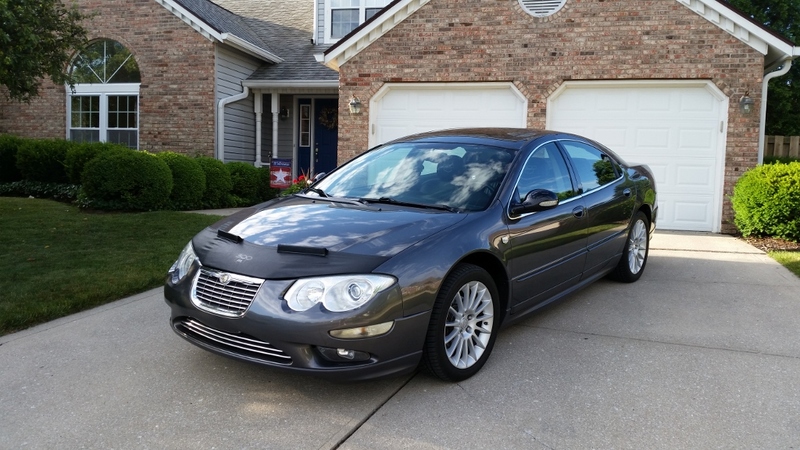 Getting to know the people of this club on a personal level and hanging out with them for several days develops friendships that will last long after the cars we love no longer drive the highways. Anyone reading this write-up or any from other past meets that have not yet come to a meet, make it a bucket-list item for next year. You won't regret it. "Newbie" lol.. yeah yeah. Tell you what though I dont feel like it. You guys again made me and Steph feel like family. As I write this my heart is warm felt for all of you. What a great time we had. On the way home we recapped the weekend that brought nothing but smiles. The people,the cars and the food was awesome. YES BOB THE THRASHER FRYS ROCK.... Keith I was impressed with M-pressive what a sweet ride. 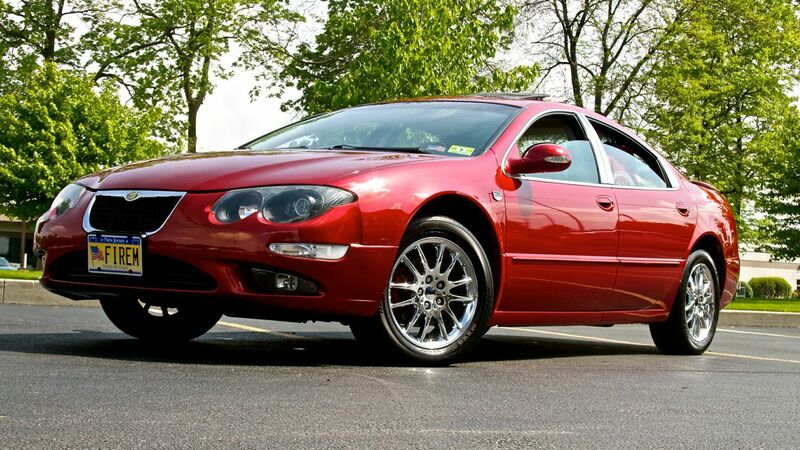 (I think I need to go a little lower with StealthM) Robert love those headlamps lotta time their well played. Mr. Bee, love the super clean brakes and FirePower intake. And Goofy well what can you say about that ,the kids just loved her. And lets not forget the King of Clean ,FireM. Oh how nice it must be to be THE MAN. Love ya Bob. It was nice to hear so many people commenting (good ones)on our rides. No substitute for good taste I suppose.... anyhow till we all meet again, Be safe everyone and take care. I was proud to debut the car with everyone this past weekend. Thanks for being a part of it! The only I don't like about this meet, is having to go home and look to the calendar for the next meet. We always say it, but I wish we lived closer. Seems over the next few years many of us will be moving somewhere along the eastern seaboard. Who knows, maybe we can make a central point for get-togethers.